We spotted a hot new coupon! 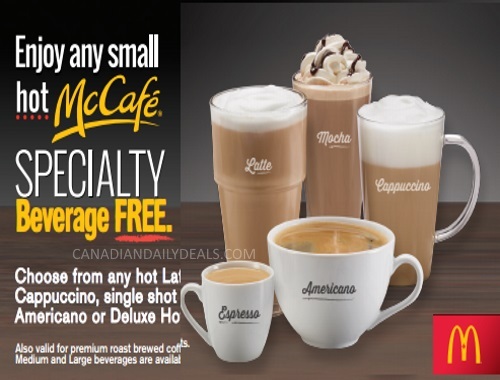 Get a Free Smalll Hot Mccafe Specialty Beverage with the coupon below! Choose from hot Latte, Mocha, Cappuccino, single shot Espresso, Americano, or Deluxe Hot Chocolate. Coupon expires June 23, 2017. Valid only at participating McDonald’s restaurants in British Columbia, Alberta, Saskatchewan, Manitoba, Northwestern Ontario, Yukon and Northwest Territories.